Still Need To Register?? Just Come To The Hotel and Register At The Door! Awakening a Generation for His Kingdom. There's a new youth conference and it's presented by Kingdom Bound! Featuring Reggie Dabbs, Wes Aarum, Hopper and more this event is specially geared for 7-12 graders and their leaders to encounter the overwhelming love of Christ…awakening the soul, understand who He is…awakening the mind, know who He is & what His Word says…awakening the heart and Celebrate who He is…awakening hope. We love our Youth Leaders and encourage all groups to bring adult youth leaders to minister to their kids. Therefore, for every 7 registrations, your leader comes for free. (8th registration will be automatically added to order). NEED TO REGISTER STILL?? Online Registration is now closed, but you can still register at the door! Come to the hotel and we’ll check you in! 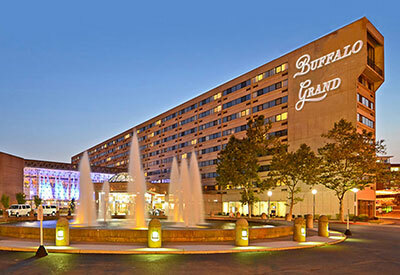 The entire conference will take place at the Buffalo Grand Hotel (Formerly Adams Mark) in downtown Buffalo. If you are calling in, please indicate that you are booking with the Awaken Youth Conference. All rooms are doubles and include a microwave and refrigerator.